OBJECTIVES: To assess differences in access to antiretroviral treatment (ART) and patient outcomes across public sector treatment facilities in the Free State province, South Africa. DESIGN: Prospective cohort study with retrospective database linkage. We analysed data on patients enrolled in the treatment programme across 36 facilities between May 2004 and December 2007, and assessed percentage initiating ART and percentage dead at 1 year after enrolment. 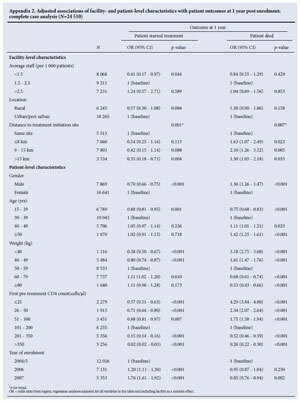 Multivariable logistic regression was used to estimate associations of facility-level and patient-level characteristics with both mortality and treatment status. RESULTS: Of 44 866 patients enrolled, 15 219 initiated treatment within 1 year; 8 778 died within 1 year, 7 286 before accessing ART. Outcomes at 1 year varied greatly across facilities and more variability was explained by facility-level factors than by patient-level factors. The odds of starting treatment within 1 year improved over calendar time. Patients enrolled in facilities with treatment initiation available on site had higher odds of starting treatment and lower odds of death at 1 year compared with those enrolled in facilities that did not offer treatment initiation. Patients were less likely to start treatment if they were male, severely immunosuppressed (CD4 count <50 cells/µl), or underweight (<50 kg). Men were also more likely to die in the first year after enrolment. CONCLUSIONS: Although increasing numbers of patients started ART between 2004 and 2007, many patients died before accessing ART. Patient outcomes could be improved by decentralisation of treatment services, fast-tracking the most immunodeficient patients and improving access, especially for men. We report on patient outcomes, including the proportion of patients who started treatment and deaths before and on treatment, at 1 year after enrolment in the FS public treatment programme to assess management of patients. We examined differences in outcomes according to facility and patient level characteristics. All patients enrolled in the FS CHAM programme between May 2004 and December 2007 were included if a CD4 value was available. After testing HIV positive in any FS clinic, patients were referred to nurse-run assessment facilities for initial assessment of eligibility for treatment, which includes a CD4 cell count measurement. Patients with CD4 cell counts >200 cells/µl were asked to return for another assessment after 6 -12 months, or earlier if they experienced problems.13 Patients with a CD4 cell count of <200 cells/µl, or with World Health Organization (WHO) disease stage IV (AIDS), were referred for treatment. Patients who start ART obtain monthly supplies of medication from assessment facilities and return to treatment facilities for review of their viral loads and repeat prescriptions 6-monthly. By the end of 2007, 30 clinics and 8 hospitals distributed over the 5 health districts of the FS were participating in the programme (Fig. 1). Two clinics were excluded because of delays in implementation of the electronic data collection system; of the remaining 28, 17 were assessment-only facilities and 11 were combined assessment and treatment facilities. Seven of the hospitals provide treatment for patients from assessment facilities, the 8th hospital functioning as a specialist referral facility for the province. Routine clinical information on patients from clinician notes on standardised forms was entered into the FS electronic medical record (EMR) system by trained data capturers and downloaded and imported into a data warehouse weekly. During this time, Meditech SATM was gradually implemented as the EMR system across the facilities.14 As each patient has a unique identifier within Meditech, they can be tracked across facilities within the province. 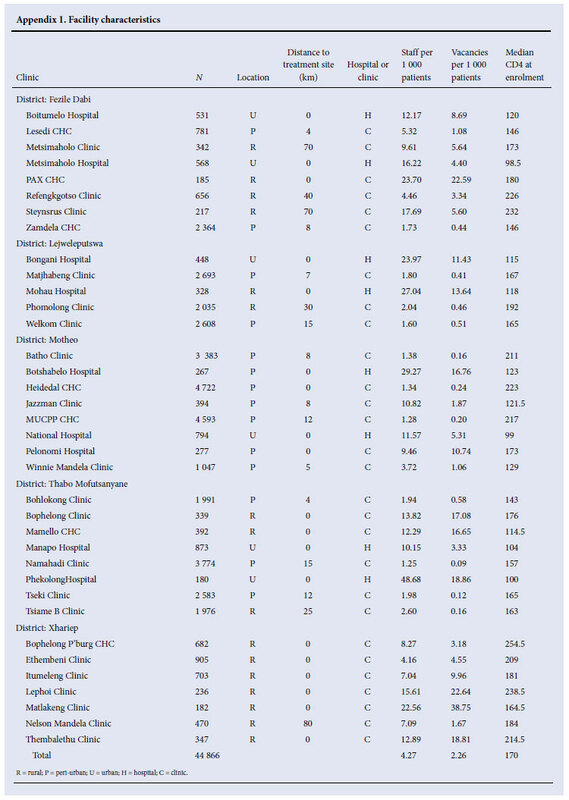 Mortality is ascertained by monthly linkage (using national identity numbers) with the national death register, which is estimated to capture more than 90% of adult deaths in South Africa.15 Patient demographic and clinical characteristics extracted from Meditech included gender, age, weight and CD4 count nearest to enrolment and year of enrolment into the programme. The Meditech database was linked with the National Health Laboratory Services (NHLS) database to obtain CD4 measurements to ensure that data were as complete as possible. The FS Department of Health gave permission for the data to be analysed, and the Human Research Ethics Committee of the University of Cape Town approved the protocol. No individual patient consent was deemed necessary as data were collected routinely for the CHAM programme, and no patient identifiers were included in the extracts used for analyses. Information was obtained from programme staff on the type of facility (assessment-only clinic, treatment hospital or combined assessment and treatment clinic), location (rural/peri-urban/urban), health district, and distance between the facility and the point of care for initiation of ART (in kilometres). Data on staffing levels were obtained from the FS Human Resources database and included patient load, number of staff per 1 000 patients and number of staff vacancies per 1 000 patients. Staff per patient was calculated as the mean number of staff in each clinic over the period April 2005 - September 2008 divided by total number of patients enrolled in that clinic. Patients were followed up to 31 December 2008, and all patients therefore potentially had at least 1 year of follow-up time. The outcomes of interest were whether the patient had initiated treatment or died in the first year after enrolment. We tabulated the characteristics of each facility and examined completeness of recording and variation in patient characteristics across facilities. We estimated median waiting times for treatment and mortality and assessed outcomes at 1 year after enrolment, by district, facility location, distance to ART initiation site and year of enrolment. We used a mixed-effects logistic regression with random intercepts for facilities to estimate the odds of the patient starting treatment or dying within 1 year of enrolment, allowing for between-facility variability. Patient-level characteristics included in the model were gender, age, weight, CD4 count and year of enrolment. Year of enrolment was categorised as 2004/05, 2006 and 2007, as 2004 and 2005 were similar in terms of patient outcomes. Facility-level characteristics included in the model were staffing per 1 000 patients, location and distance to ART initiation site. Location was categorised as rural or urban/peri-urban and included in the model as a binary variable. We fitted a sequence of four models to the data to assess the variation explained by facility-and patient-level characteristics: (i) the null model with no covariates; (ii) including patient-level characteristics only; (iii) including facility-level characteristics only; and (iv) including both facility-and patient-level characteristics. We examined the reduction in the standard deviation of the random effects distribution in each of these models. 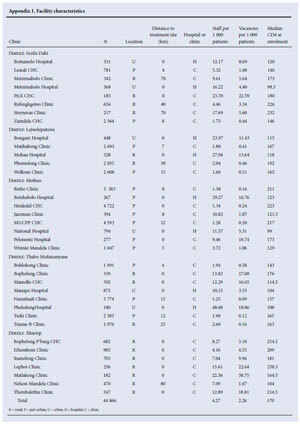 Table I shows the characteristics of each health district in the programme, and characteristics of each facility are given in Appendix 1 (Appendix 1 appears in the web version of this article only). The Motheo district includes mostly urban facilities and had the largest number of patients enrolled, while Xhariep had only rural facilities and had the smallest number of patients. Fig. 1 shows the location of each district within the province, together with the major towns in each district and locations of facilities. Table II shows the variability in completeness of data according to district, location and distance from treatment site. Completeness of weight records was the most variable, ranging from 16.2% to 94.1% recorded; these records were most complete in urban facilities. Rural facilities had the most complete recording of CD4 counts and peri-urban facilities had the most complete ID recording. Facilities with ART initiation on site had the least complete CD4 records. Between 2004 and 2007, 44 866 treatment-naïve patients aged 15 years or over were enrolled across the 36 facilities. As reported in Appendix 1, the median CD4 cell count at enrolment was 170 cells/µl and ranged across facilities from 98 to 255 cells/µl. Sixty-seven per cent of patients were female (range 54 -76% across facilities), mean age at enrolment was 36 years (range 33 -38 years), and mean weight was 57.6 kg (range 54.7 -59.7 kg). Data were missing for age in 22 patients (0.05%), for weight in 15 550 patients (34.7%) and for CD4 count in 11 650 patients (26.0%). Table III shows patient outcomes by district, distance to ART initiation site, location and year of enrolment. Xhariep had the lowest pre-ART mortality (13.6%) and the highest median CD4 cell count at enrolment (211 cells/µl). In contrast, Thabo Mofutsanyane had the highest pre-ART mortality (19.2%) and the lowest median CD4 count (151 cells/µl). Fezile Dabi had the highest percentage initiated on ART (48.4%), and for those who initiated, had the shortest median waiting time for treatment (1.65 months). Despite having major urban centres, Motheo district had the longest waiting times for treatment (3.70 months). Over all clinics, percentage initiated on ART ranged from 7.9% to 82.2%, and mortality ranged from 8.1% to 32.8%. For those who were treated, median waiting times ranged from 1 day (in a hospital setting) to 5.4 months. Of all deaths 83% occurred in patients not receiving ART. Compared with assessment-only facilities, facilities where ART was available on site performed well in terms of proportion of patients who started treatment, except for those in Xhariep district, where there was no doctor for several months. Xhariep has only rural clinics, and all but one of these were combined assessment and treatment facilities served by sessional doctors. Rural facilities had higher median CD4 counts at enrolment than peri-urban or urban facilities. Treatment hospitals had lower median CD4 counts, were mostly in urban areas and served sicker patients. 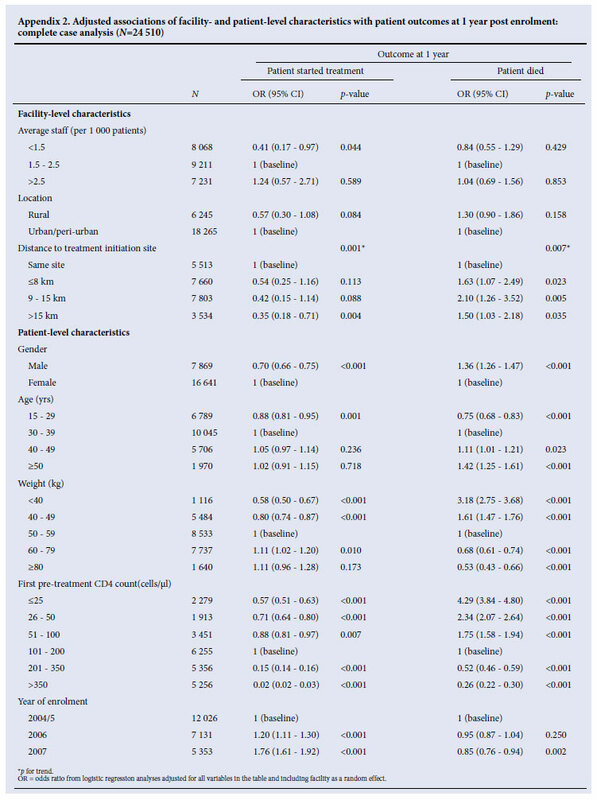 Table IV shows mutually adjusted odds ratios (ORs) for the association of facility- and patient-level characteristics with (i) starting treatment and (ii) death within 1 year of enrolment. As type of facility was strongly related to distance to ART initiation site, we were not able to assess the effect of both variables. Similarly, staffing levels, patient load and vacant posts were all strongly related to each other and independent effects of these variables cannot be assessed. We chose to include the distance to ART initiation site, and staffing levels, in our models. The odds of initiating treatment declined with increasing distance to ART initiation site (p-value for trend <0.001). 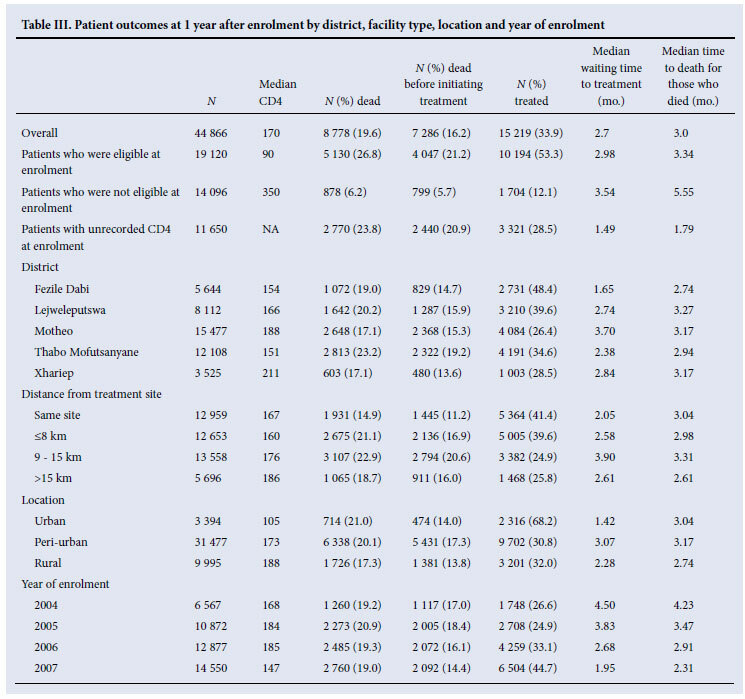 Patients enrolled in facilities where ART was not available on the same site were more likely to die (OR 1.55, 95% confidence interval (CI) 1.28 - 1.89) compared with those enrolled in facilities where ART was available on site. 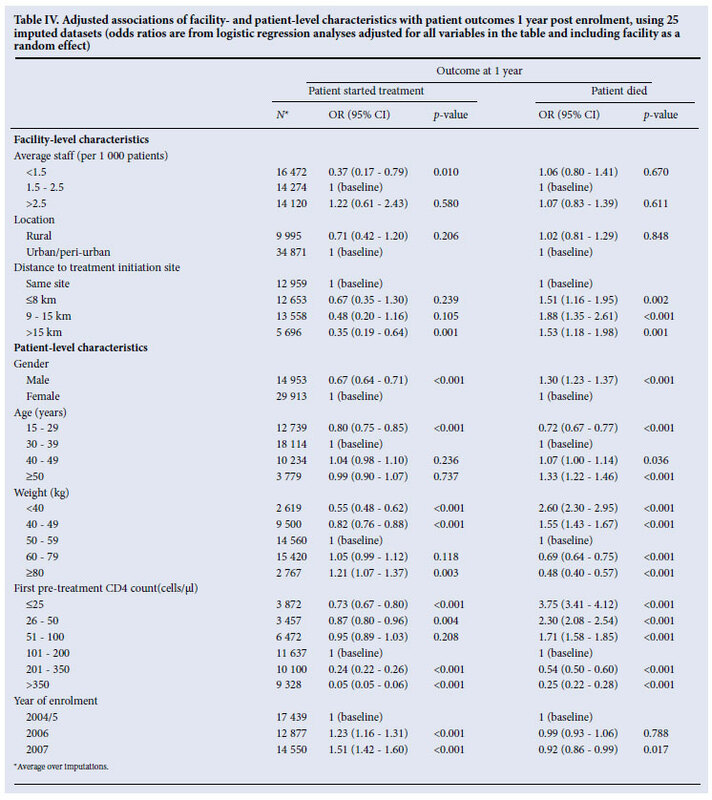 Men were less likely to have started treatment (OR 0.67, 95% CI 0.64 - 0.71) and were more likely to have died within 1 year of enrolment (OR 1.30, 95% CI 1.23 - 1.37). Compared with older patients, those aged 15 - 29 years had lower odds of starting treatment (OR 0.80, 95% CI 0.75 - 0.85). The odds of starting treatment increased with weight and with CD4 count up to the threshold of 200 cells/µl. The odds of dying within 1 year of enrolment increased with age and decreased with weight and CD4 count. Patients enrolled in 2007 were more likely to start treatment than those enrolling in earlier years. In the complete case analyses (N=24 510, reported in Appendix 2 - web version only), the association of staffing levels with the odds of starting treatment was attenuated and the associations of location, distance from ART initiation site and CD4 were strengthened. The association of year of enrolment with the odds of dying were strengthened. In the imputed data, weight had a median of 56.5 kg (interquartile range (IQR) 49.0 -65.4), compared with 56 kg (IQR 49.0 -64.0) in the complete case data. CD4 had a median of 173 cells/µl (IQR 80 -316) in imputed data compared with 170 cells/µl (IQR 76 -318) in complete case data. Most of the variation across facilities in the odds of starting treatment was explained by facility-rather than patientlevel characteristics. In the null model for starting treatment, facility level standard deviation (SD) was 1.58 (95% CI 1.33 - 2.08); this fell to 1.46 (95% CI 1.26 - 1.83) when patient-level characteristics were added and to 1.22 (95% CI 1.13 - 1.38) when facility-level characteristics were added. Including both patient- and facility-level variables resulted in an SD of 1.19 (95% CI 1.11 - 1.33). We found a large amount of variation in odds of starting treatment across facilities and that differences in facility-level characteristics, rather than patient population, appear to drive this variation. Overall, by the end of 2008 around 34% of adults in the FS public sector programme received ART within 1 year of enrolment. The odds of starting treatment within 1 year increased between 2004 and 2007. However, large numbers of patients continue to die, most deaths (83%) occurring in patients not receiving ART. Patients who were eligible at enrolment and started ART waited a median of almost 3 months before starting treatment. Patients were less likely to start treatment within 1 year if they were male, severely immunosuppressed (CD4 <50 cells/µl), underweight (<50 kg), or sought care from a facility where ART initiation was more than 15 km away. Men and patients enrolled at facilities where treatment could not be initiated were also more likely to die in the first year after enrolment. This cohort is one of few studies to report on outcomes after enrolment in HIV care and not just from treatment initiation.9,21,22 A strength is that it is a large cohort, representative of the HIV-infected population based on routinely collected data in the FS, where there is an established data capture system in place with mechanisms to follow up specific data queries in each clinic. National identity numbers have been documented for a large proportion of patients and regular linkage with the national death register means that ascertainment of death is fairly complete, even in those lost to the programme. In an earlier study using the FS data, only 20% of all deaths were recorded in the medical records,7 which emphasises the importance of linking to the national death register. A limitation is the large number of patients with missing weight and CD4 measurements. Although CD4 measurements were routinely taken on almost all patients, the database recorded them on only half of the patients in the cohort. This was improved to three-quarters of the patients by linkage using deterministic matching with records of blood results obtained from the NHLS. Our results may be generalisable to patients enrolling in care in similar settings, but cannot be applied to the population that is HIV-infected and not seeking care. We showed large differences in outcomes between facilities, which have implications for how HIV programmes are monitored. HIV prevalence is commonly monitored through sentinel surveillance, and specific research questions are often addressed using sentinel sites.27 However, sentinel sites may over-represent urban settings and not be representative of the general population.28 Care should be taken when evaluating programmes based on these data. Patients who are assessed in one facility, but have to attend another to initiate ART, are disadvantaged compared with those who attend combined assessment and treatment facilities for all their care. This suggests that assessment-only facilities should be enabled to provide treatment or to ensure prompt referrals to treatment facilities. The referral process is one example of a barrier to accessing care. Drug-readiness training may be another barrier, as it can be protracted. Distance to appropriate facilities and transport costs may also be a barrier to access, particularly in rural locations. It is not always clinic practices that lead to delayed uptake of ART. 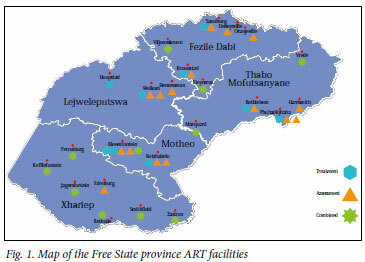 In 2008, the FS had the lowest ART coverage of all South African provinces, estimated at 25.8%, which is probably due to the large proportion of eligible patients who are unaware of their HIV status.29 The 2005 Human Sciences Research Council household survey found that only 36% of HIV-infected adults had ever been tested for HIV.30 Lack of awareness of HIV status contributes to the delayed uptake of ART, and campaigns should continue to target people who are unaware of their status. This study was funded by the National Institute of Allergy and Infectious Diseases (NIAID, grant 1 U01 AI069924-01). Suzanne Ingle was funded by a UK Medical Research Council PhD Studentship and Margaret May was funded by UK Medical Research Council grant GO600599. The FS ART data warehouse was developed with the help of a research grant from the International Development Research Centre, Canada (IDRC-102411). The funders had no role in study design, data collection and analysis, decision to publish, or preparation of the manuscript. We also gratefully acknowledge the data capturers, nurses and doctors of the Free State programme, MediTech for assisting with data downloads to the warehouse, Terry Marshall and Sue Candy for assisting with the preparation of NHLS data, and Adrian Spoerri who helped with data linkage. We acknowledge all those who died without access to ART. Conflict of interest. The authors declare that they have no conflict of interest.